As young farmers and ranchers across the country celebrated the reintroduction of the Young Farmer Success Act (H.R. 1060) in the U.S. House of Representatives last week, the issue was also taken up in several state capitals. The burden of student loan debt on young farmers is too important an issue to address solely on the federal level. This year, NYFC and farmer leaders in multiple states are working to advance state legislation to provide student debt relief to young people who are feeding their communities. 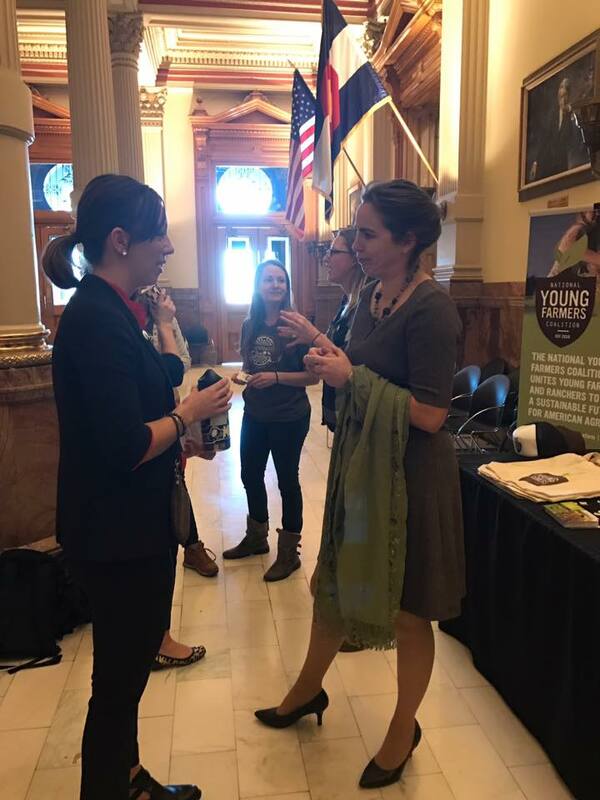 State Senator Kerry Donovan meets with NYFC’s Southwest Organizer Cassidy Tawse-Garcia and local farmers during NYFC’s CO legislative meet & greet last week. Across the country, states are taking action to invest in the next generation of farmers and ranchers, rural communities, and our nation’s food security by helping young people better manage their student loan debt. Several states already offer programs that help with student loan repayment to encourage eligible graduates to pursue careers in agriculture, and to do so in their state. 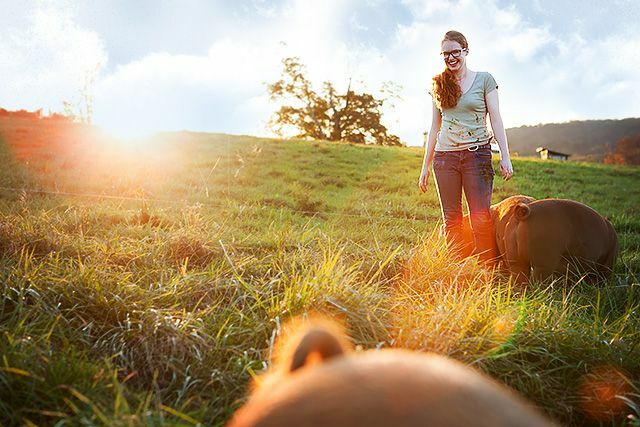 The New York State Young Farmers Loan Forgiveness Incentive Program, for example, provides student loan repayments (up to $50,000 over the course of the program) to individuals who obtain an undergraduate degree and commit to operating a farm in New York State, on a full-time basis, for five years. Pennsylvania’s Agriculture Education Loan Forgiveness Program provides a similar service. These programs are designed to attract new farmers and ranchers to the state, thus promoting the sustainable growth and long-term viability of the agriculture industry and rural communities. Leanna Mulvihill received loan forgiveness through the New York State Young Farmers Loan Forgiveness Incentive Program. NYFC is a strong advocate for these programs and is in the process of working with several states to develop new student loan repayment programs and ensure that these programs work for young farmers and ranchers. In Wisconsin, for example, NYFC is working with a state representative this session to reintroduce a bill that would establish a New Farmer Student Loan Assistance Program. Once established, the program would provide grants up to $30,000/person over a period of 5 years to help cover the cost of repaying student loans and interest. The program would be available to state residents who have graduated from an accredited institution of higher education (not limited to Wisconsin schools) whose primary occupation is operating a small farm, defined as between $35,000 and $500,000 in gross annual sales. Applicants must also have started to operate a small farm no later than 5 years after obtaining a degree and commit to operating a small farm in the state for at least 5 years after applying to the program. Similar efforts are underway in New Jersey, Montana, and New Mexico. We can’t do this alone. As we work to build support in Congress for the Young Farmer Success Act, taking similar actions on the state level helps to multiply these efforts and broaden the scope of solutions to this critical challenge. If you are a young or aspiring farmer or rancher who is struggling with student debt, please reach to NYFC to learn more about opportunities to find out how you can engage with policymakers in your state to tackle this problem, and how NYFC can help! become engaged on these issues and access resources to promote similar programs in your state!! If you’re interested in state-level advocacy on this or any issues facing young farmers, please contact Andrew Bahrenburg, National Policy Director, andrew@youngfarmers.org.